The Technical and Research Committee on Reclamation celebrated more than three decades of excellence in mine reclamation practices in the Province of British Columbia. 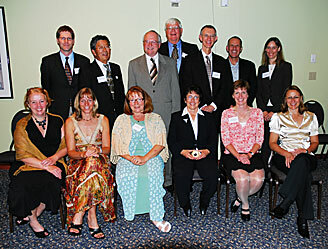 Thirty-one years ago, the British Columbia Technical and Research Committee on Reclamation established a Reclamation Award to recognize outstanding achievement in mine reclamation in British Columbia. 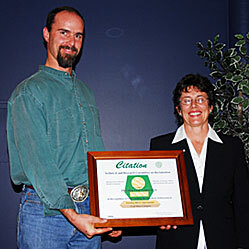 In addition to this major award, citations are given to recognize merit in mining reclamation. 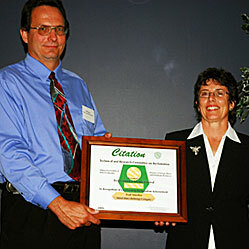 For work conducted in 2006, the Committee received 8 excellent nominations in 5 categories. Last year’s winner of the Award was Elk Valley Coal Corporation for its very fine reclamation work at the Fording River Operations. 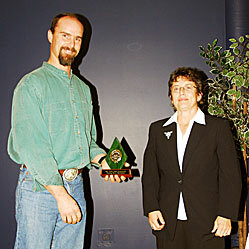 Greg Sword accepted the “keeper trophy” on behalf of Elk Valley Coal Corporation. 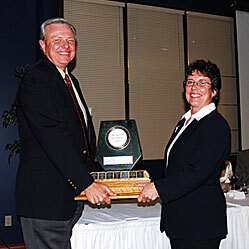 Greg Sword accepting the "keeper trophy" on behalf of Elk Valley Coal Corporation. The Citation for outstanding achievement for reclamation at a mineral exploration site was awarded to Canarc Resource Corp. for their work on the Polaris Taku property. The historic Polaris-Taku minesite saw production of gold, silver and copper between the 1930’s and 1950’s. The mine, mill and town site were abandoned shortly thereafter and abundant mining and milling equipment was left at the site. In 2006, with a full-scale operational diamond drill program and regular flights to and from the remote town of Atlin, Canarc Resources Corp. made the proactive decision to hire extra personnel for the purpose of remediating the site. The plan was to remove any environmentally hazardous materials, to reclaim as much of the disturbance as possible and to improve the overall looks of the site. regrading of the disturbed areas. The reclamation work completed was a significant undertaking for a small exploration company, and demonstrates a very strong commitment to environmental stewardship. Bruce Bried and Garry Biles accepted the reclamation Citation for Mineral Exploration on behalf on Canarc Resources Corp.
Bruce Bried and Garry Biles accepting the reclamation Citation for Mineral Exploration on behalf on Canarc Resources Corp. The Citation for outstanding achievement for reclamation at a sand and gravel operation has not been awarded in the last 5 years. 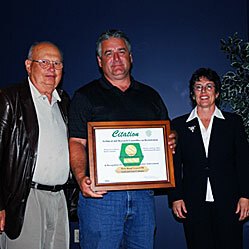 This year Little Rock Quarries Ltd. was recognized for their reclamation work at the Ross Road Gravel Pit. The Ross Road gravel pit is located within the city of Abbotsford in prime agricultural and rural residential lands. Gravel extraction in the 50 hectare pit ended in 2005, and since that time, 30 hectares have been reclaimed to class 1, 2, and 3 agricultural lands. Approximately half of this 30 hectares is a productive vineyard and the other half is used for grazing beef and dairy cattle. Reclamation involved filling and regrading pit areas to form a natural landscape, placing 30 centimeters of screened sand, overlain by 30 to 50 centimeters of imported topsoil. The remaining pit areas are in the process of being reclaimed and developed into a 230 unit subdivision. The Ross Road pit is a testament to the successful reclamation of a once very active gravel pit, to a variety of end land-uses. Brent Palmer and Frank Sojonky accepted the Citation for excellence in Sand and Gravel reclamation on behalf of Little Rock Quarries Ltd.
Brent Palmer and Frank Sojonky accepting the Citation for excellence in Sand and Gravel reclamation on behalf of Little Rock Quarries Ltd. The Citation for outstanding achievement for reclamation at a quarry was awarded to Three Point Properties for their work at the Bamberton Quarry. The former Bamberton Quarry and Cement Plant is located on the west shore of Saanich Inlet, only 35 Km from the city of Victoria. The quarry operated from 1913 to 1953, and the cement plant ceased operations in 1980. After that time, the town emptied, and the site lay dormant and in a derelict state until 2005, when Three Point Properties purchased the former mine and plant site and inherited all of the site liabilities. This included a large open quarry with steep high walls which posed significant health and safety concerns, the abandoned cement plant and three large landfills containing 750,000 tonnes of metal contaminated soils. Their intent was to develop the area into a high quality, low density housing development with an emphasis on maintaining the natural beauty and environmental integrity of the area. remediating the 750, 000 tonnes of contaminated soil. This involved excavating it from the 3 existing landfills areas and placing it in an engineered disposal facility in the pit. An engineered dam was constructed at the opening to the quarry to ensure confinement of the materials and a water management/seepage collection system was developed. The contaminated soil was placed in half metre compacted lifts with a final 1 metre clay cap cover. At an estimated cost of more than 12 million dollars, the reclamation plan is now complete, and the overall health and safety risks of the site have been significantly reduced. Monitoring of quarry effluent seepage and the off shore will continue into the future to ensure no impacts to Saanich Inlet occur. The reclamation of Bamberton Quarry exemplifies how a large historic brownfield site can be successfully remediated. Michelle Mahovlich, Jack Julseth and Ross Tennant accepted the Quarry Reclamation Citation for the Bamberton Quarry on behalf of Three Point Properties. Michelle Mahovlich, Jack Julseth and Ross Tennant accepting the Quarry Reclamation Citation for the Bamberton Quarry on behalf of Three Point Properties. This year the Technical and Research Committee on Reclamation chose to award the Metal Mining Citation to a very closely related activity, that being metal refining. 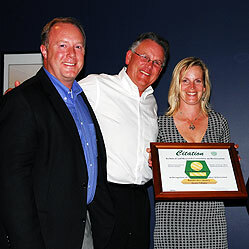 Teck Cominco Metals Limited was recognized for their outstanding efforts at the Trail Smelter. It is widely known that more than a century of lead and zinc smelting and refining activities at the Trail Smelter led to significant negative impacts on the vegetation in the Columbia River valley. Extensive early logging and burning, plus the acidification of soils from high sulphur dioxide from smelter emissions, severely constrained the recovery of local plant communities. Significant reductions to sulphur dioxide emissions combined with reclamation efforts that were initiated in the 1940’s resulted in the greening of most areas of the valley. However, the Columbia River bank directly below the smelter continued to be devoid of vegetation due to, coarse, dry, acidified soils, the dumping of smelter materials, and the extreme steepness of the slopes, which in some areas reached 38 degrees. In 2006, Teck Cominco voluntarily initiated the reclamation of this challenging river bank area using innovative equipment and bioengineering approaches with the goals of controlling erosion, improving wildlife and fish habitat values, establish vegetation and improve the visual aspects of the site. Each of four land units were subdivided and evaluated in detail with varied reclamation prescriptions developed to reflect slope, moisture and quality of parent materials. Rather than installing a manufactured retaining wall on the riverbank slope, Teck Cominco opted for soil bioengineering techniques to achieve a more natural looking landscape. A custom growth medium was applied which consisted of peat or pulp mill biosolids combined with organic fertilizer, lime, a fungi inoculant and natural humic complexes. Brush layering techniques were applied and live cuttings and pioneering plant species were utilized to initiate natural vegetation and successional processes. Innovative equipment was also used to complete the work. A tethered Schaef Walking Excavator (also known as a Spider Hoe), plus a cable-lifting system were used to implement the reclamation work on such steep terrain. Teck Cominco is being recognized for its corporate due diligence and for its creative approaches to vegetating and stabilizing the Columbia River bank. It is also noteworthy that this reclamation work has also qualified for scientific tax credits. Bill Duncan of Teck Cominco Metals Limited accepted the Reclamation Citation for Metal Mining (Refining) for the Trail Smelter. 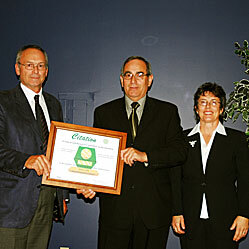 Bill Duncan of Teck Cominco Metals Limited accepting the Reclamation Citation for Metal Mining. This year, the Citation for outstanding achievement for reclamation at a coal mine was awarded to Elk Valley Coal Corp. for its work at Fording River Operations. Elk Valley Coal Corporation’s Fording River Operation has been conducting progressive reclamation in the upper Elk Valley for over 30 years. In 1992, Fording River received approval of the Henretta Creek Dragline Project, which necessitated the removal of the fish bearing Henretta Creek. As a condition of their Mines Act permit, Fording was required to reconstruct the creek to capabilities that existed prior to mining. Once mining in the area was complete, studies were undertaken on the hydrological, biophysical, fisheries and reclamation aspects necessary to support creek redevelopment and a sustainable fisheries habitat. Restoration efforts began with the engineering of the structural components of the new creek channel. Immediately after the new creek was reconnected with original sections of Henretta Creek, pockets of riparian vegetation, including woody and herbaceous species, were established. As well, coarse woody debris, large boulders, and spawning gravels were strategically placed, all of which form necessary habitat components that are required to support a sustainable fish population. Monitoring studies of the creek restoration efforts are on-going. The results of studies to date on fish populations, vegetation, and benthic invertebrates, clearly shows that a functioning aquatic ecosystem has been restored and that fish populations are performing better than those that existed prior to mining. As well, the Henretta Creek Channel is demonstrating continual improvement in biodiversity that should continue to increase over time. Fording River Operations has done an excellent job of re-establishing a large creek as well as a fishery, in a mining disturbed area. Greg Sword accepted the Citation for outstanding Coal Mine Reclamation at Fording River Operations on behalf of Elk Valley Coal Corp.
Greg Sword accepting the Citation for outstanding Coal Mine Reclamation at Fording River Operations on behalf of Elk Valley Coal Corp. The recipient of the 2006 British Columbia Jake McDonald Mine Reclamation award is BHP Billiton Diamonds Inc. for their outstanding reclamation achievements at the Island Copper Mine. The Island Copper open pit mine operated between 1971 and 1995, and during this time, it was the third largest producer of copper and the largest producer of gold in Canada. It’s now been 12 years since the initial closure of the mine. Revegetation efforts at the site have been hugely successful due to the temperate climate, abundant rainfall, use of till covers, and the planting of site appropriate species, such as red alder. Virtually all of the mine’s 700 hectares of disturbance have been successfully revegetated and the reclaimed lands are already demonstrating evidence of early successional processes. Over time, the reclaimed areas are expected to evolve into natural assemblages and it is expected that the mine’s closure objectives of productive forest and wildlife habitat will be achievable. Since the initial closure, BHP Billiton has come to recognize the challenges with managing a closed mine site that will require care, maintenance and monitoring in perpetuity, principally due to the evolving nature of mine drainage and its treatment requirements. Additionally, the company has been faced with how to apply the same diligence and excellence in the post-closure period, that existed with a fully staffed operating mine. BHP Billiton has risen to this challenge by implementing a comprehensive risk-based approach to minimizing and managing the mine site risks to people, the community and the environment. As a result of this approach, a series of management manuals were developed for the mine, additional mitigation was implemented and the closure plan for the site was updated. Management manuals and systems were developed for key areas and risks of the site including water management conveyance structures and inspections, water quality sampling, laboratory methods, components of the Pit Lake operating procedures, telemetry and telecommunications systems, as well as health, safety and emergency response systems. These management systems allow the care and maintenance of the site to be tracked continuously and reported on a regular basis to the closure management team. Where BHP Billiton’s risk assessment identified residual risks that were considered high, additional research and mitigation measures have been implemented. An extensive research program was conducted at the Island Copper Pit Lake that included using large scale enclosures to test pit lake treatment effectiveness. As a result of this research, an innovative mitigation was engineered to stabilize the thickness of the top layer of the Pit Lake by lifting middle layer water using passive means, ensuring the physical stability of the layered Pit Lake, and allowing it to continue to operate as a semi-passive biological treatment system while preventing discharge of non-compliant water to the environment. Two projects were recently undertaken in the north area of the mine to improve and protect water quality in the downstream Francis Lake and Stephens Creek watershed. A shallow groundwater collection system was installed in 2002, to convey acidic seepage to the Pit Lake treatment system. More recently, the diversion of the Twin Lakes to the Pit Lake has provided additional long term protection of downstream water quality. In 2004, acidic seepage was also identified from the South Dump. Although most seepage was collected and pumped to the pit, residual long-term risk to the nearby marine environment was considered high enough to warrant further remedial action. Since the collection system needed to operate at mean sea level, the challenge was to engineer a system that would capture maximum seepage from the waste rock dump, without collecting seawater. The solution was a novel vinyl sheet-wall that is resistant to salt-corrosion. A total of 822 interlocking and sealed vinyl sheet piles were vibrated into the ground to a depth of 12 metres, to form a 500 metre long wall. This is the first application of this technology in North America as a very-low permeability barrier and now other major mining projects are considering applying this technology. BHP Billiton’s management of the Island Copper Mine is exemplary with respect to safety, innovation, risk management and the quality of reclamation and environmental protection work. Ben Wichers accepted the 2006 British Columbia Jake McDonald Mine Reclamation Award on behalf on BHP Billiton Diamonds Inc.
Ben Wichers accepting the 2006 British Columbia Jake McDonald Mine Reclamation Award on behalf on BHP Billiton Diamonds Inc.
From top left to right: Gavin Dirom, MABC, Bob Hamaguchi, Highland Valley Copper, Peter Jarman, Ministry of Environment, Art O’Brien, retired Ministry of Energy, Mines and Petroleum Resources and Symposium Venue Coordinator, Bob Hart, Environmental Assessment Office, Bill Price, Natural Resources Canada, Cassandra Hall, AME BC. From bottom left to right: , Cathy Pomeroy, Western Canadian Coal Corporation, Wendy Gardner, Thompson Rivers University and Incoming Symposium Chairperson , Brenda Dixon, Natural Resources Canada, Barb Riordan, Thompson Creek Mining Limited, and 2006 Symposium Chairperson, Kim Bellefontaine, Ministry of Energy, Mines and Petroleum Resources, and Kim Bittman, Teck Cominco Limited.